On the 22nd of August 1972 a large number of people gathered in the Waroona Memorial Hall about starting a speedway. Mr Bob Foley was elected president along with a working committee, Within the next few weeks the shire gravel pit on Peel Road East was secured and Waroona Contracting started clearing the ground, The original track was 418 yards around. On the 5th of October 1972 the north bend was named "Hull Bend" in appreciation for Mr Jim Hull's assistance on the fledging club. On December the 17th 1972 the first trial meeting was held with Mr Allan (Bluey) Butler having the honour of being the first person to roll over in the very first race of the clubs history, A second trial day was held on the 21st of January 1973, dust and a lack of clear numbers and drivers names still were a problem. On the 11th of January 1973 an election of new office bearers occurred and Mr Jim Ward became the president. Waroona Speedway was opened by the then Shire President, Mr Jim Iseppi, on Febuary the 11th 1973, the first official race meeting. It took many people to get those first race days off and running but the club boasted a large membership (100 plus) and an ever growing number of prestigious events, and state titals. Collie's Jeff Morton receives his trophy from Alcoa's Colin Wood, standing behind it club president Jim Ward. Harold Thomas recalls: Cliffs EJ Stockie started as a hire car with McKenzie Motors in Bunbury, when I bought it, believed it had done about 140 thousand miles but later found out it had been around the clock one more time, actually 240 thousand miles. I retired it from the road and intended to race it as a stock production but got swamped with Bunbury Car Club administration etc, and so passed it on to Cliff, I don't think he ever ran the car at Bunbury so I didn't actually see it race, It appears it raced in its original factory blue paint colour. During the 1994 - 1995 season the Waroona club introduced a perpetual shield for there annual Inter Club challenge. The anaugural season the shield was raced for was won by the Waroona team in 1975. Pictured is Alan Graham proudly holding the shield prior to any winners plauqes being added. Like many of our superstar drivers even Gary Sutton has torn up a bit of gear, here is one in his EH Holden production car riding and rolling down the bank on the back straight at Waroona Speedway, captured by Mal Cooper. Whoops here we go again, this time on the front straight entering turn one also in the EH once again Mal Cooper was on the spot with the camera. The Waroona club hosted a round of the West Australian Division 2 State Championship at the Waroona Speedway with a full field of drivers. 1984 - Mike Coles 22 from Perth with Garry Sutton outside 18 in EH and Kevin Green in the #10 at Waroona Speedway. Dan Hewitt recalls: The yearly Waroona Stock Car Championships were approaching and I didn't have an engine for my LC Torana stock car that I was racing at the time, So Foot Robinson lent me the engine out of his old Demo Derby car. We got the meeting under way and I made it through the heats and into the feature, thats when the engine developed a horrible noise with a couple of laps to go, I saw Footy standing on the embankment waving me on, Then with half a lap to go, the engine spat a rod out the side, I managed to hold on for second in the B Stock Championship and drove the car back to the pits and turned it off, much to everyone amazement. 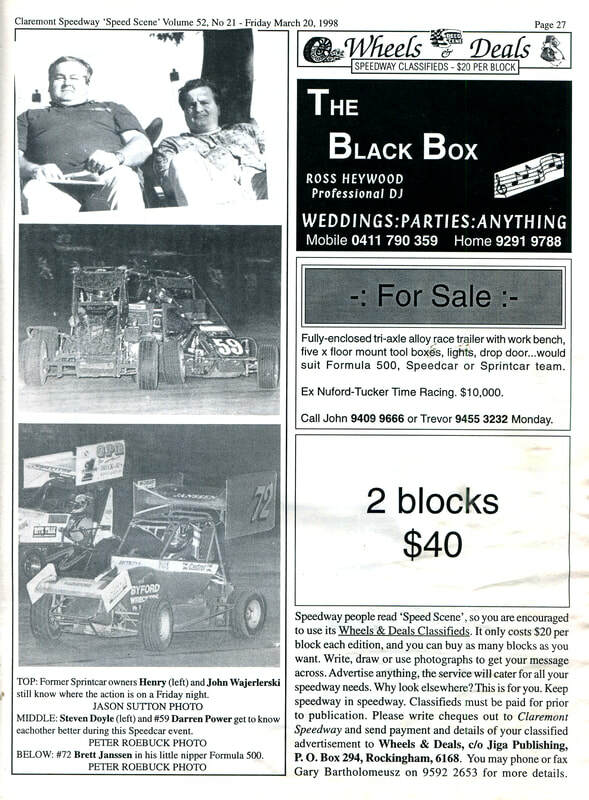 Brian Ellement recalls: In the late 1980's six sprintcars turned up for a Waroona meeting, It was a top day, Good people and the track was quick. It had its final meeting in 1988 when it hosted the South West Games speedway event for the city of Mandurah, a very successful event. Unfortunately the club folded as the sport became over regulated and the costs skyrocketed for competitors. The ever increasing cost of insurance for small clubs made it impossible to continue. 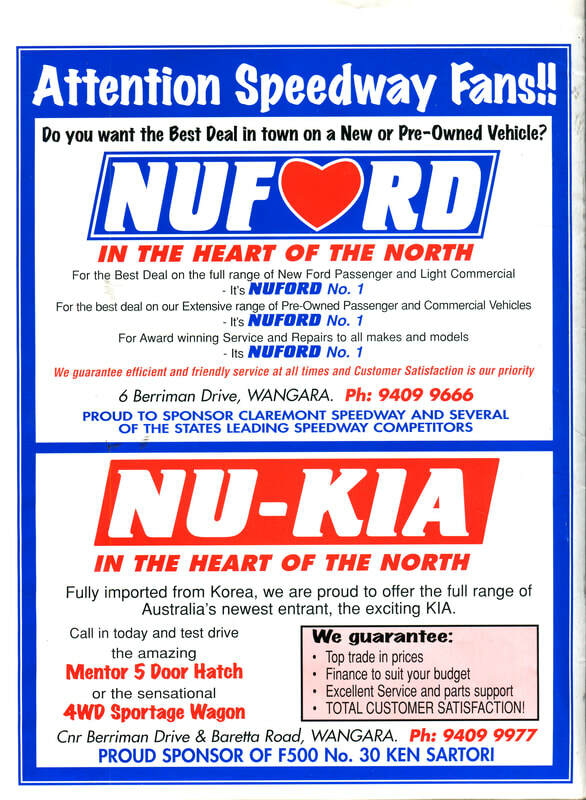 We still have people competing who originally called Waroona their home. Thanks to the people who had the courage to start it all in the first place, some of those being Bob Foley, Ross Woodley, Neil Twaddle, Vic Iseppi, (origial four members) Allan Butler, Jim Ward,Graham Twaddle, Geoff and Charlie Parker supported by their wives and many more.